The New Hampshire Department of Corrections welcomes the voluntary collaboration, commitment and support offered by private citizens, organizations, and agencies to supplement rehabilitative services offered to adult felons under incarceration, probation or parole. For the personal safety of community members, correctional staff and criminal offenders, certain institutional security protocols are required in advance of any intended voluntary services. Please refer to the links below for forms you might need. This NH DOC development training course is designed to expose student interns to the structure of a prison environment and the goals of re-entry into society through the divisions of Field Services and Community Corrections. 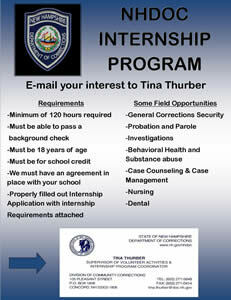 Student interns will be familiarized with the responsibilities of correctional staff within the organization with a focus on the roles of correctional officers, case management, classifications, and Field Services. Interns will receive an overview of department services and divisions to include medical and forensic services as well as education, treatment and program services available to incarcerated individuals. The NH DOC staff member responsible for the intern will impart information relevant to the New Hampshire Department of Corrections current policies and practices. DOC needs help in specific areas from time to time and we will be posting these opportunities in this space when they occur. 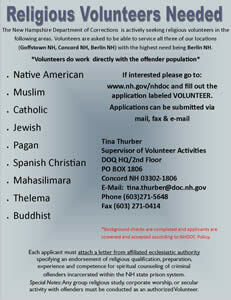 These are always unpaid volunteer positions, with little to no contact with inmates. Check back from time to time to see what is available! Clerical Volunteers. They would help keep up with scanning records, filing, and other duties as needed. This is at the New Hampshire State Prison for Men on North Main Street, but it is outside the secure perimeter. Inmate contact is limited to office cleaners and helpers. The hours would be decided by you and the administrator in charge. Correctional Industries: The Department of Corrections is inviting volunteers who are willing to share their specific trade skills in these Correctional Industries shops: Woodworking/Cabinetmaking, Upholstery, Printing, and Signmaking/screenprinting. We are flexible on the number of hours. We are just looking to get a different perspective to the inmates on how the jobs they learn are done on the outside. If you have an interest in volunteering please contact Ron Cormier, Administrator of Industries, and 603-271-1875 or by e-mail at Ronald.Cormier@doc.nh.gov. Remember, these are unpaid, volunteer positions! You would need to meet with the administrator of the specific area and have an informal interview where you would discuss the duties, hours, etc. Before being able to start working you would need to have submitted the volunteer application, passed the background check, and attended the orientation class. If you have completed your application form and need to attend an orientation you must schedule your session in advance and receive confirmation that you can attend. We will not accommodate unscheduled walk-ins for these sessions.